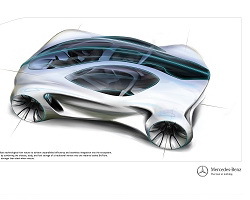 The theme for the 2010 LA Design Challenge is efficiency and low weight. German and Japanese design studios are also competing for the first time. It's no secret that car makers go to all-out when it comes to concept models at major motor shows, but the Los Angles Auto Show easily spawns some of the most weird and wonderful. For the last seven years, organisers of the LA show have thrown down the gauntlet to the big name manufacturers and challenged them to come up with a concept car that suits a particular theme. This year, it comes as no surprise that the theme is 'minimizing consumption of the earth's resources'. Hot shot designers had to come up with efficient concepts that could seat four and weigh no more than 1,000lb (about 454kg). The rules also state that the car would have to be comfortable, safe and deliver the same level of performance that buyers have come to expect from modern cars, without compromising on styling. It's usually the big Southern California car design studios that compete in this challenge, but top brass at the LA Auto Show decided to allow the Germans and the Japanese to join the party this year.